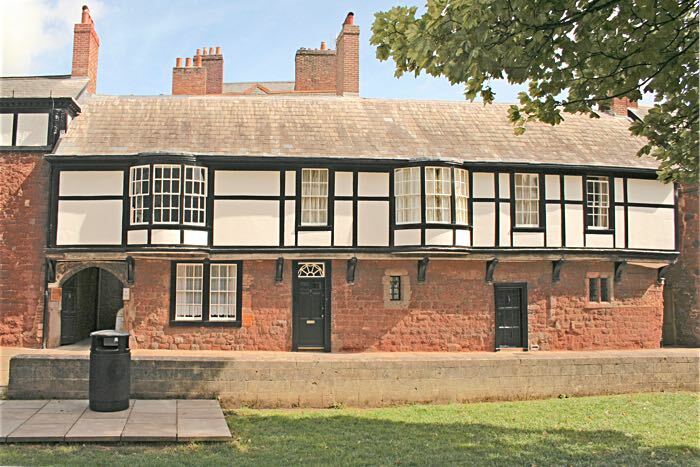 This attractive group of buildings, with a central courtyard, next to the Devon and Exeter Institution, was constructed for the use of the Cathedral canons and dates from about 1500. There have been many modifications, since, with the Notaries' House at the rear the last major addition. Parts of the building may date as far back as 1450, the lower frontage is Heavitree stone, with an oversailing half timbered upper storey, which is supported by oak brackets on stone corbels. The arched entrance on the left, leading to No 8, is of beer stone with carved spandrels (the triangular sections, with one curved edge, forming the arch) with a heraldic design of four crosscuts and saltire, that of the cathedral’s Chancellor. In the centre of the frontage is a fanlight door to No 9. On either side of the door to No 9a are two small rectangular stone windows. The upper floor has two bow windows and three smaller sash windows set into the timber and plaster front. Beyond the open passage on the right is the entrance to the building’s very real claim to historic glory—the hammer beam roof, the construction of which is similar in style to that of Westminster Hall. 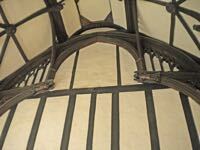 Cores from the timber dates the construction of the roof to between 1417 and 1442. Supported by four timber trusses, the two central trusses that divide the roof into three are supported by ornamental stone corbels, carved into angels and lions. There are eight wooden angels, each placed at the end of a hammer beam forming one side of a triangle, supported by a curved brace, both attached to the vertical wall beam. The three sides of the triangle are carved from one piece of timber. A unique aspect of the roof is the curved, or barrel vault at the top. 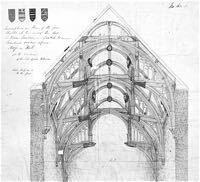 This design can only be found in Devon, sharing the feature with the Guildhall, the Archdeacon’s house at Palace Gate, Bowhill and Cadhay (the barrel vault was removed in the 1730s). There are six opposing carved lions at the base of the rafters, each carved from a piece of oak. 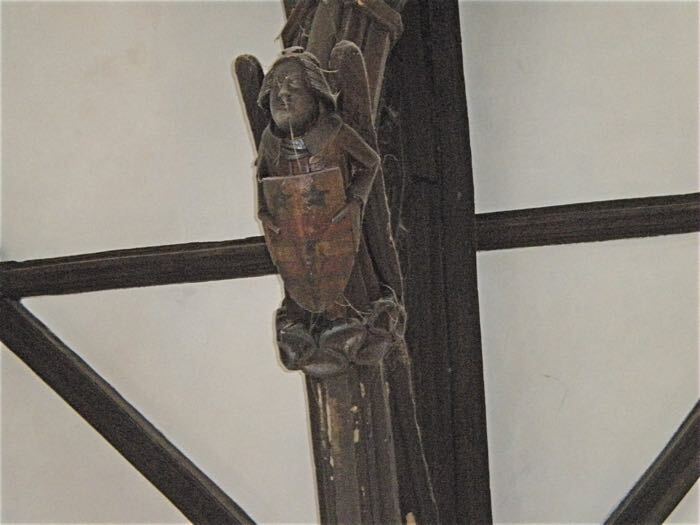 There are numerous other carvings at the intersection of purlins, wind-braces and rafters, including a depiction of Jesus, a king, a bishop, and assorted other faces. This house at the rear of 8 and 9 Cathedral Close is a handsome building that is often overlooked, as it faces the rear of Princesshay. An entry in the Dean and Chapter Act Book of 1692 said that the "most and the Chiefest part” of the property "was lately burnt down”. The actual damage was contained by the thick Heavitree stone walls, to the northern section of Nos 8 and 9, while the hall, east and south ranges escaped the blaze. The rebuilt house in three storeys, plus a basement and an attic, is constructed of red brick. The front of the house, which faces Princesshay, has a central doorway flanked by two sash windows on each side, and five sash windows on the second and third floors. The entrance has an ionic porch with double doors and fanlight. The pressure emanating from the Reformation placed a burden on the Exeter Dean and Chapter to reduce some of the peripheral church institutions associated with the Cathedral, including the number of canons, and to lease their residences in the Close to secular tenants. 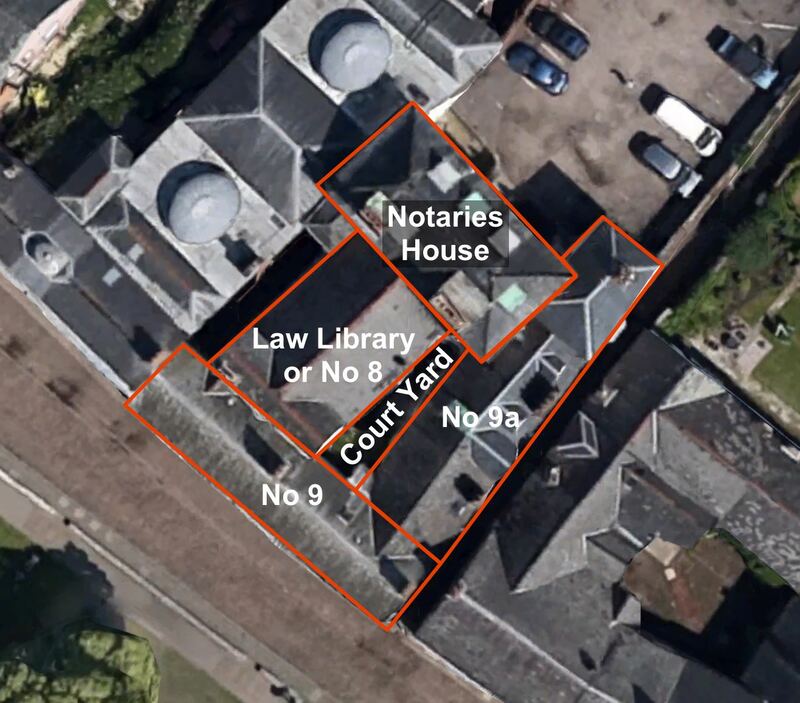 Nos 8 and 9 Cathedral Close was one such house, leased for £2 to William Bruton in 1603, whose family resided in the house for several generations. The Civil War was the excuse for the Commonwealth to appropriate church property, but this move passed over the Bruton family, no doubt with some relief. William Bruton was assessed at £10 for the 1660 Poll Tax,—his household of four daughters and two servants paid 12d. The property was large as Bruton was assessed for 14 hearths, for the hearth tax. By 1668 the property was leased by Christopher Bale, who had married into the Bruton family. Bale moved to the Mansion House in 1692, after the property suffered a serious fire. He sub-let 8 and 9 to two tenants, resulting in two hearth tax demands, one for nine and five hearths. John Gibbs was in residence in 1715, subletting the smaller half to a Madame Hawkey. By 1737 Edward Weston held the lease—after his death, Mrs Weston retained the lease—she paid £46 land tax in 1751. The smaller part had several tenants up until the 19th Century. A Weston descendent, Anne Weston was in residence in 1806, with the Rev Heberden occupying the smaller part. The building comprised of a front dwelling, valued at £26, with a small courtyard, and a rear dwelling house, garden, back building, stable and loft valued at £95 in 1838. The front property was occupied by Samuel Wesley, the Cathedral Organist—it would be occupied by a succession of Cathedral Organists over the coming years. There were changes of tenants over the next few years, until 1881 when No 8 was occupied by a stockbroker, William Ingersent, and 9a was uninhabited. Soon after, No 8 was sublet to the Exeter Law Library, while No 9 was still the residence of the Cathedral Organist. Most of Cathedral Close survived the bombing of 1942, including Nos 8 and 9. In 2008, a planning application from Wetherspoons for No 8 was rejected, to turn No 8 into a restaurant and pub, with a rear beer garden. Despite objections in 2011 when the University announced it wanted to close the Law Library, the library was moved to the main campus and No 8 occupied by the community interest company, Sustaincare. Crafts men and women could meet for printmaking to knitting and sugarcraft. A monthly cake and craft fair was run where their creations could be sold. The space was also open for a limited time on certain days where the public could drop in for a cup of tea and coffee, and inspect the roof. Chandni Chowk, an importer and retailer of Indian soft furnishing and crafts moved from the Custom House to No 8 in March 2015. 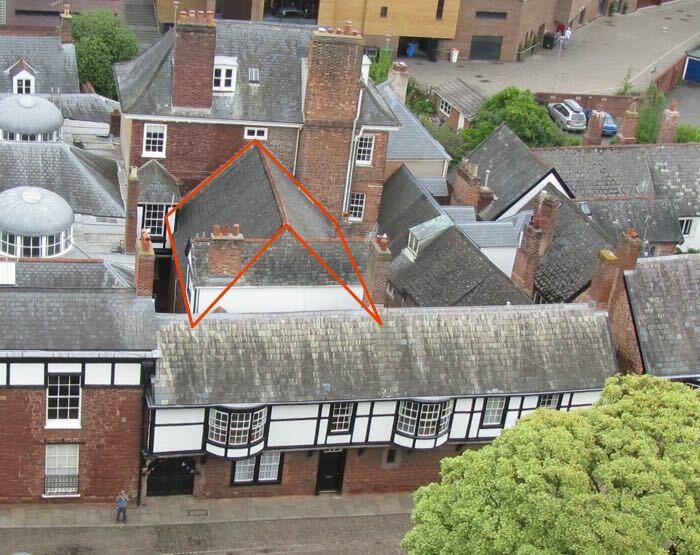 It is inevitable that such a building will have to find new uses in a changing world, but so long as public access is still allowed to view the interior of such a unique and historic building, then one of Exeter’s gems will remain. 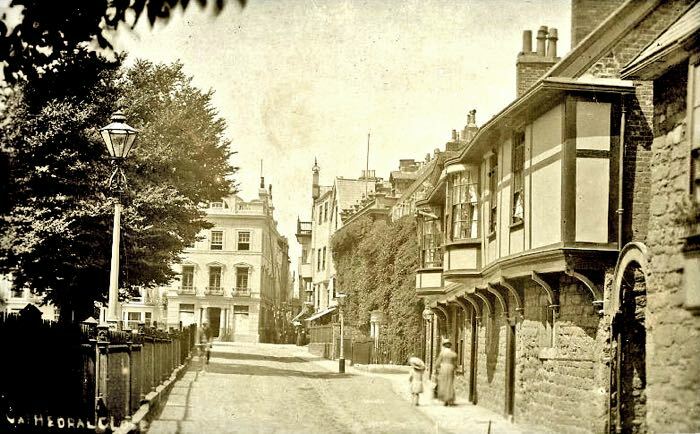 Source: Exeter City Guide Books, trade directories, An Archaeological Assessment of Nos 8 and 9A Cathedral Close, by Exeter Archaeology, Express and Echo and British Listed Buildings. The front of 8, 9 and 9a Cathedral Close. Photo © David Cornforth. The red line delineates the hall. The Notaries' House is the building behind the hall. Photo © Nadezhda Keenan. Cathedral Close with 8, 9 and 9a on the right. 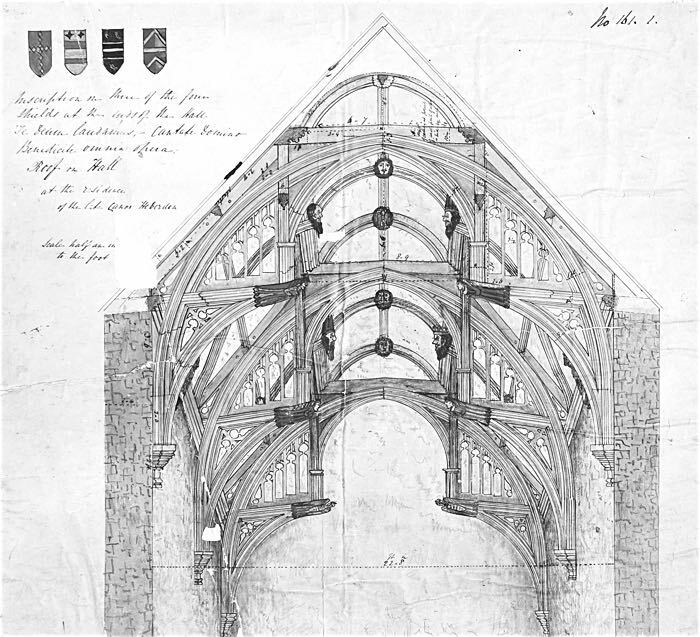 A 19th Century drawing of the roof. © The Devon and Exeter Institution. Two of the hammer beams with angels. Notice the barrel roof at the apex of the roof. Photo © Julia Sharp. One of the angels at the end of the hammer beam. Photo © Julia Sharp.